Woodcocks have declined substantially as a breeding bird in the last twenty years. The map showing change from our First Atlas reveals that they were present in just 15 tetrads in both surveys, with birds in ten new tetrads now, and lost from 101 occupied during 1978-84. This is not an easy bird to census. BTO CBC results show decreases every year from its peak in 1974 until the end of the CBC in 1999, with a 76% drop in that quarter-century. From the end of our First Atlas fieldwork period in 1984 there has been at least a 60% fall in the national population, so it is not surprising that this Atlas shows a substantial contraction in range, and Woodcocks are now almost entirely a bird of eastern Cheshire. Most of the Atlas records were of birds in May or June roding, their peculiar display flight in which males fly in circuits just above the woodland canopy in the half-light of dawn or dusk, emitting low pitched grunting noises and loud shrill disyllabic whistles. The sounds can carry up to 300 m and probably attract the attention of a female, which in turn entices the male to the ground. Woodcocks are polygynous, with a few older, dominant males roding for the longest each day and obtaining most of the matings with females, whereas first-year males only rode for short periods. Birds were recorded for this Atlas roding in eight tetrads, with a bird visiting a possible nest site in another and one observer reported pairs in another two tetrads. The only confirmed breeding record came from Daresbury Firs (SJ58R) where a bird was inadvertently flushed off eggs at the base of a fir tree in a heathland regeneration area. According to the annual county bird reports, this appears to be the first proven breeding since 1984. Although they are probably under-recorded, it seems unlikely that the county population will be more than 20 or 30 breeding females, a substantial drop from the estimate of 150 just twenty years ago. Birds were recorded for this Atlas in a range of woodland types: broadleaved (9 tetrads), coniferous (2), mixed (6), waterlogged (carr) broadleaved (2) and waterlogged coniferous (2). Their preferred breeding habitat is deciduous or mixed woodland, with conifer plantations used up until they become too dense; at least some understorey and damp earthworm-rich soils are important, as are wide rides and small clearings (2-4 ha) in larger woods. 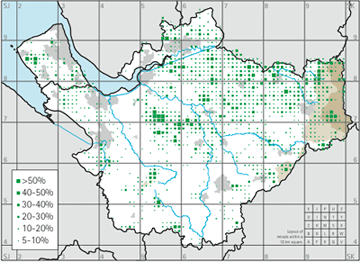 Their current breeding distribution corresponds roughly with the most wooded parts of the county. Woodocks probably merit a place on the Red List of species of conservation concern, but are currently Amber Listed until specialised surveys have ascertained their true status as a British breeding bird. The reasons for the species’ decline are not well established, but the hypotheses include recreational disturbance, the drying out of natural woodlands, overgrazing by deer, and the maturation of new plantations (Fuller et al 2005).